I am a proponent of legalizing all drugs. Not just marijuana, but everything including heroin, cocaine, meth, etc. Those of you who know me, know that addiction has become a sad part of my family’s life with a daughter who is addicted to opiates and opioids. You might ask, how could I possibly be a proponent for legalizing something that has been the root of so much pain in the lives of my family? The answer is, drugs are not the root of the problem. They are merely a symptom of a much greater problem. Let’s not forget, my daughter became an addict even when the drugs she consumed were illegal. So did every other addict. From that perspective, the laws were totally ineffective in preventing hers and other’s substance addiction. These laws did nothing to serve her, the millions of other addicts, or the families of those that love them. The question we might ask is, have these laws prevented others from this terrible affliction? I posit that it has not and there is ample evidence for that position, which I will lay out below. A positive outcome from legalization or decriminalization is that we could dramatically reduce the stress on courtrooms, law enforcement, prison systems, and an enormous drain on our public budget. But wait, there’s more. The principal argument against legalization is that it would result in increased experimentation and use by those that would otherwise be deterred because of the legal implications. This would presumably result in dramatic increases in addiction. On the surface, legalization would seem to be counter-intuitive, but after decades of evidence showing that making it illegal hasn’t worked, it’s time we stopped using speculation as justification for public policy regarding drugs. It’s time to use evidence, and evidence abounds. Science and medicine has always been predicated on evidence. This is why we continually see demands for evidence based solutions to problems. So why are we unwilling to use evidence to consider alternatives to our current policy? The answers to this are complex and many, much of which is entirely political and unfortunately, related to an industry that thrives on continuation of the status quo (a subject for another article perhaps). What evidence do we have for legalization? Perhaps the single biggest pilot program ever conducted on the subject. 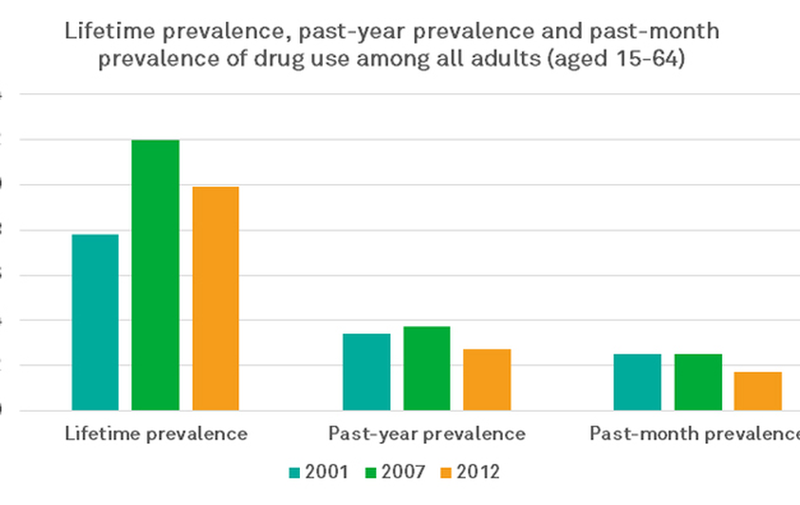 Portugal decriminalized all drugs sixteen years ago and the evidence is in. It worked. By nearly every possible measure it was a resounding success. Portugal still has a war on drugs, but they took an entirely different, albeit a counter-intuitive approach. They changed the strategy for their war. They decriminalized everything, but perhaps more importantly, they took the money they had been using to combat drugs and refocused it on education, job training and placement for addicts, and increased psychotherapy. The results were, and still are, stunning. Injected drug use is down by 50%. Overdoses, addiction, and HIV are massively down. The chart below is from this article in Policy.mic. It’s important to understand the difference between legalization and decriminalization however. Portugal simply removed any penalties for use and possession of any drug, so long as it was equal to or less than 10 days of use. You cannot walk into a store and buy it. It’s still sold primarily on the black market, which in my opinion is a mistake. Legalized drugs, where you could buy it under certain restrictions, would greatly diminish the likelihood of death by overdose caused by mixing the product with other dangerous substances. Additionally, decriminalization leaves in place a black market that is subject to corruption, poor quality substances, and a criminal element that need not be there. But the evidence is there for anyone to read. It was an experiment with a population of over 10 million people. Much is heard today about the opioid epidemic, but these substances are only at the forefront because of the lethal implications of overuse. With that exception, they’re no different than alcohol, gambling, smoking, and sexual addictions, which are all legal. These other addictions just take longer to kill you. It’s hard to understand why we can’t admit failure from a public policy perspective, but it’s even more frustrating to know there is a much better way of prosecuting this war.